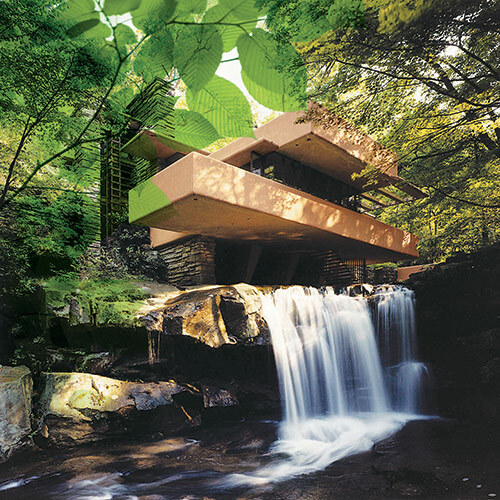 At PPG, we find inspiration everywhere, but especially in nature, just like Frank Lloyd Wright. The colors used throughout his iconic Fallingwater® allow consumers and designers to bring harmony between humanity and its environment. In this palette, organic greens pair with deep browns to depict the never-ending inspiration Wright found in plants and vegetation. Moth Gray, a brown-gray blend which works well with granite and trending metals, and ties in yellow-toned hardwoods used in many Frank Lloyd Wright-inspired designs. Cherokee Red is one of Frank Lloyd Wright's signature colors and is used throughout on the metal framing on windows and doors. It is the color of iron ore, found regionally. The exterior is painted Covered Wagon, a sere color that is reminiscent of the dying rhododendrons in the fall which Frank Lloyd Wright liked. Explore key colors Frank Lloyd Wright preferred and specified.